I live in New York. See it through my eyes. Pictures taken at Mother’s Ruin, NYC. Ring in the last picture was from my July (2016) Lit-Cube box, from LindaMunequita’s Esty shop. The decor in Park Avenue Winter was fabulous – I wish I took a photo. The food was wonderful and eating in such a beautiful environment only made it more gratifying. For dinner, I ordered the Crab Cake, the Short Ribs and the Gingerbread Pudding. Everything was delicious, but the star of the meal was the Gingerbread Pudding. I was expecting the creamy sort, but instead it as the cake sort and it was delightful (and delicious) surprise. First off, I would completely miss Vandal if I wasn’t paying attention. The front looks like a store that sells plants, and the name is nowhere to be found. While waiting for my friends, there were a lot of confused people who stepped in, then stepped outside again, looked up to see what the sign said (there wasn’t any) then walked in again. The decor inside is beautiful. There are different themes scattered throughout, the table where we were sitting had photos on the wall from when they were decorating the interior. We sat under this lovely lamp. Vandal had some unique light fixtures. I would call the food a fusion of many different cuisines. For example, I ate the Korean Rice Cake dish for appetizer and Churros with Spicy Chocolate for dessert. For the main course, it was steak on top of fried rice, topped with an egg. Everything was tasty. #teampixel #restaurantweek oh, hello steak! Everything about the show added to the experience of the show. From the set pieces, to the wonderful and often hilarious costumes, to the absolutely remarkable musical numbers – not to mention the numerous mentions of other musicals, the show keeps you enthralled from its first note to the very last. My favourite number was “A Musical” which was packed with so many references (both visual and audible) that I wasn’t able to catch them all! But, I did find a handy video from WSJ explaining all the references afterwards, and I’m happy that to report that I picked up quite a few of them. Broadway week is happening right now, so if you do have a moment, I’d highly recommend going to see this hilarious show. Did I mention it has musical references, fun costumes and Shakespeare? It’s the second day and I’ve already broken the rules! But this story, while not about something I love, should still entertain. Yesterday was the first of the month, I had to get a monthly pass for the LIRR and the train that I finally caught cancelled at Jamaica. Again. For the second time in three weeks. A wonderful start to the month. Hello Monday! On my way back home, I boarded the D train just in time to hear the conductor, over the loud speaker, letting everyone know that there was a stalled train at 34th and we’re being held at the station. The F train pulled into the station on the track across from the D and I decided, perhaps that line is working since this line is being held. So I got off the D train and got on to the F and guess what, the D train pulled out of the station. Thinking, oh well, perhaps the issue has been resolved and the F will run, I stayed on the F train and watched as another D train pulled into the station – and then pull out of the station. The doors to the F train remained opened. The B train pulled out of the station! Hurrah! The F train pulled out of the station. Boo. A unicorn walked into the train! What?! If you guessed two, then you are correct. At this point I gave up on the expectation of making it to Penn in time for my train, so I thought to myself, why not go over to the downtown track and take the train to Brooklyn, where I can get the next train home from Atlantic Terminal, after all, the downtown trains were coming and going all this time. So, out of the B train I went and over to the downtown track where, I found out that now, no B or D downtown trains were running. This week, a workmate (who shares my love of dumplings) and I decided to have dumpling taste test for lunch. There were three places that we heard of that were all referred to as “the best dumplings in the city”, but we were skeptical, we had to stack them up against each other to see who really deserved the title. Vanessa’s Dumpling House on Eldridge Street was my secret favourite. I have been dropping by there at least once a week for a month now and I absolutely love their dumplings. Prosperity Dumpling on Clinton Street was recently featured in the Gothamist’s The 10 Best Cheap Eats in NYC and tried it but couldn’t really decide if it unseated my favourite. And finally, late entry to our showdown was, Lam Zhou Handmade Noodle on East Broadway. We were going to this one on the good word of a friend; I had no idea it existed1 until the previous week when I was told this was the best dumplings he ever had. So it began; with metro card in hand, we rode the orange line to East Broadway and found ourselves at Lam Zhou. There was no counter, you sorta ordered by this little passage-way into their kitchen3, there were no stuffing options, it was just fried or boiled. Since we both liked the fried better we decided to judge on that. Lam Zhou received a 19/20. Now, I still love Vanessa’s but when you stack them up with the other two their overall grade was 17/20. A short walk later found us at Prosperity where we ordered 4 Chives & Pork dumplings for $1.25 (and a bottle of water for $1 each). On a whole this gave them a 19/20. It was a tie between Lam Zhou and Prosperity, but in the end it all comes down to your preference. If you like the thin wrappers and can have 11 dumplings in one sitting, then go with Lam Zhou. If you like slightly thicker wrappers then head on over to Prosperity. Vanessa’s isn’t without its good points though. If you have a larger group, they have more seating and more choices of the three. My preference is thinner skinned so I think Lam Zhou has become my new favourite dumpling place! * Well, the showdown only happened between three dumpling places because we had limited time. They were also within walking/subway distance from the office. 1. We also had no idea where it was and it was quite an adventure finding it. Keep your eyes peeled because you might walk right by it! 2. The ability to hold a half bitten dumpling, for the final bite, without everything falling apart. 3. while we were waiting, one guy who was seated for lunch yelled back to the kitchen that he wanted some more dumplings, a few minutes later they brought some out. 4. AKA the TL;DR for those who just want to get to the point. After a year of admiring the shiny (and not so shiny) bikes at a distance, I finally gave in and got a Citibike key. It took me about two weeks after getting my key to psych myself out enough so that I actually got ON one of the bikes1, but I did it and I like it. 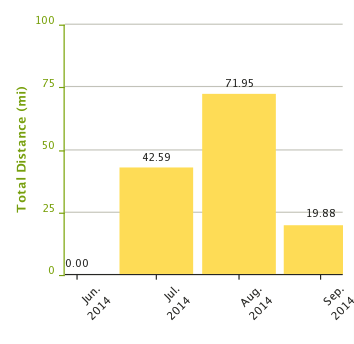 I started in August and I saw a significant lift in my biking that month, am definitely looking forward to September. Being Citibike user I’ve learnt a few things, and so I will now share my observations with you. The actual riding of the bike in the city isn’t as bad as I thought it might be. Though I do feel safer when riding on a protected path and would go out of my way to use one. Sometimes riding on the other types of bike path opens you up to cat-calls from people in their car. It’s always good to have hand sanitizer handy. ALWAYS. If you’re going to be taking a bike from, right after someone else returns it, you will most likely not like the experience of that person’s sweaty palm imprints on the handle bars. Hold the silver metal part when you are trying to loosen or tighten the seatpost clamp. Now that I’ve ridden Manhattan, I’ve finally used all its major forms of transportation – I feel like a local. Happy riding. 1. It’s scary riding a bike in the city! 2. How did I miss the whole, remove bike by lifting seat instruction? 3. There was one time when three stations were not accepting bikes and my time was running out. It was a race to find an open kiosk! What an adventure (no, not really). If/Then – You will enjoy it! I really love living in New York. I really love working in New York City. I especially love when Broadway Week rolls around! I had the privilege of seeing Idina Menzel in the new broadway musical If/Then; it was excellent. It’s the story of native New Yorker and urban planner, Elizabeth, who returns to the city from NYC from Phoenix after divorcing her college sweetheart turned husband. Elizabeth always thinks about the what ifs – what if she hadn’t moved? What if she made a different decision, would this decision have changed her life? Would her life be better or worse for it? Essentially the story branches out from one moment in the park after her return form Phoenix. For the two paths she has two nicknames, the path where she stays with her new neighbour, Kate, in the park – the Liz path – and the path where she goes with Lucas to his protest – the Beth path. There were many quick changes in between to differentiate between Liz and Beth but if you think you’ll get easily confused trying to follow the action, listen to the music and keep track of the storyline, I would suggest reading a quick synopsis about the show before venturing to watch. This way you’ll be less confused and be able to enjoy the show. However, I found that it was really easy to follow which story you’re watching and didn’t have a problem keeping them separated in my head. The soundtrack was good and sometimes funny. I really enjoy listening to Idina Menzel sing, and since she has such a powerful voice I was a little worried that she might stick out from the rest of the cast and it might become “Idina and the rest of them”; but LaChanze (Kate), Jenn Colella (Anne) had such powerful voices themselves and James Snyder (Josh) was a wonderful singer, that I had no reason for concern. The set was minimalistic yet functional with bits and pieces of fresh elements – LED subway map and the home set were really great! Overall I absolutely enjoyed it, definitely worth it if you have the time. As an added bonus, here is an article I found – Jason Tam Reveals 10 Things Fans May Not Know About If/Then.